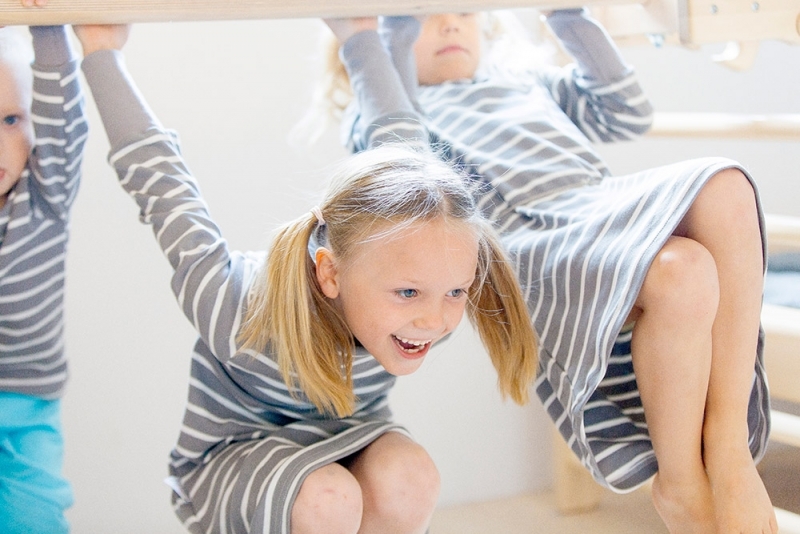 Having worked with children’s well-being for a couple of decades, Christina Nurmi, co-founder of Gymi and Head Designer of Gymi Furniture, has now designed a set of functional furniture and wants to bring natural movement to every home, school or kindergarden. “I have always loved children and have been working passionately for the well-being of kids and teens for years. Since 2008 I have run my company Gymi Health Club for Kids and Teens where I get to guide young people into the wonderful world of learning new skills and getting motivated to move. We have lost touch of the natural way to move and feel well. A child is born to move and learn new skills by repetition. 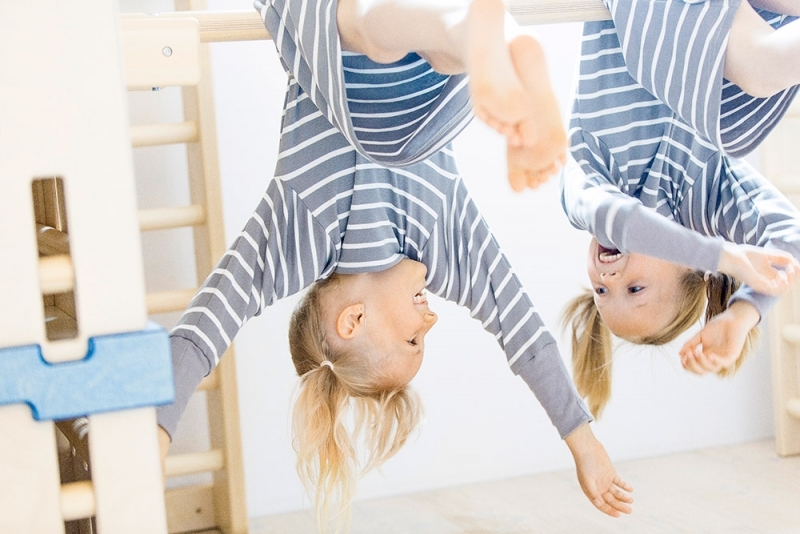 If we let them, children learn new skills by just jumping, running, climbing, hanging, swinging and trying tricks. Our task as adults is to make the environment such that an active way of life is possible. This also enhances the child’s acquisition of cognitive skills. Christina is known as the children’s gym instructor in Finnish TV (Pikku Kakkonen) and as the founder of Gymi Health Club for Kids and Teens. She has taught thousands of children and also worked as a gymnastics coach. The story of Gymi Furniture began at the gym where you could never find good enough equipment to buy. In addition, the customers at the gym started asking for all kinds of gym equipment for their homes. Also, the children were playing Gymi at home. This must have been a sign! We had to begin designing and bringing Gymi Furniture into the places where children spent most of their time, that is homes, schools and other public spaces. 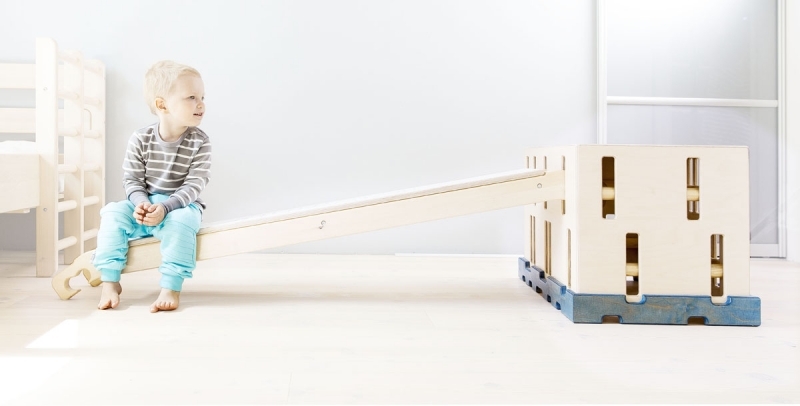 Gymi Furniture was made to motivate children to move naturally and learn skills in their own way, to activate the everyday life. We wanted the new furniture not only to be safe, long-lasting and practical but also beautiful. We found a skilled carpenter to make this all happen. Today, we have a Gymi Furniture set which includes beds and diffrerent sized boxes, wooden poles, ladders and planks. As a counteraction to our disposable way of life we wanted the clear cut Gymi Furniture to last for generations and we wanted it to fit into any space. 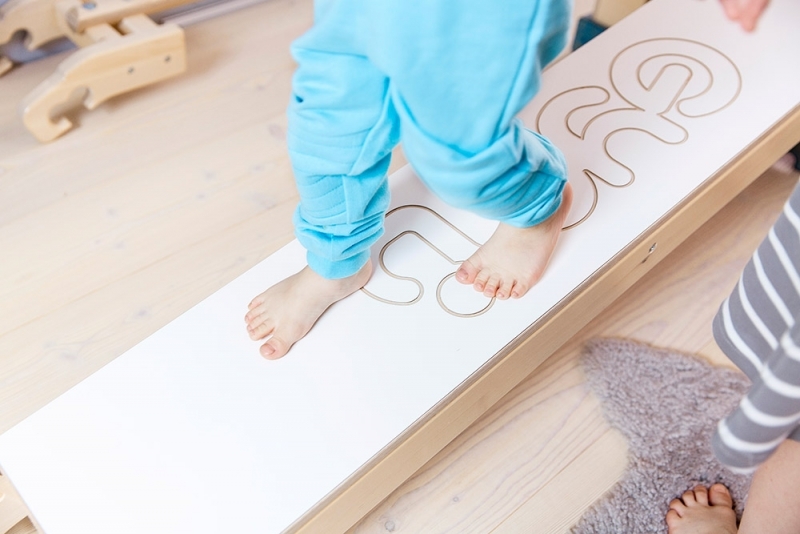 Gymi Furniture lives with you – every step of the way. The functional furniture activates your everyday life. By combining the different pieces of Gymi Furniture you can build versatile equipment for exercising – or for simply moving naturally. At the same time the pieces of furniture serve as a bed, a table, bench, a stool and a clothes rack – giving space for free play. The high-quality Gymi Furniture enables natural movement in indoor spaces. 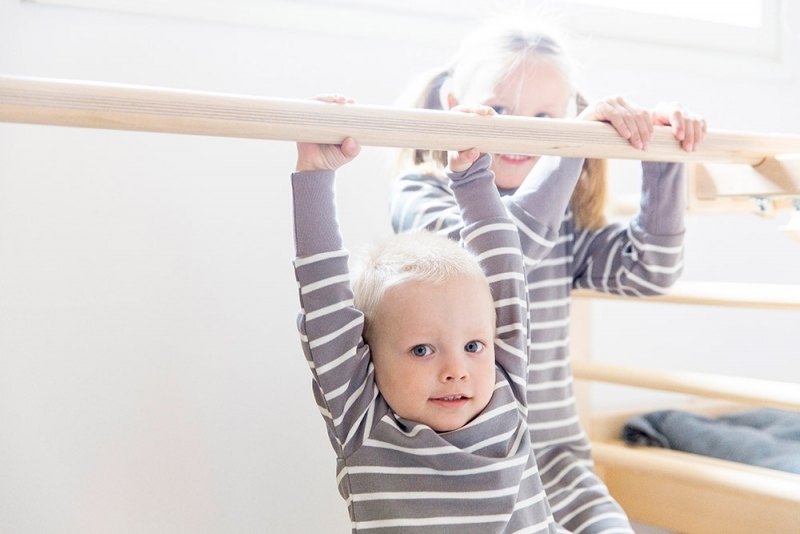 When moving on parallel bars, planks and wallbars the children automatically or with little guidance move on all four limbs, on both hands and feet, doing bear walk or crab walk or just being monkeys. Doing tricks on bars and planks improves your sence of balance and body control. At the same time your self-confidence and self-esteem develop. How does Gymi Furniture work? The timeless and long-lasting Gymi Furniture changes with the needs of your family and you can collect the pieces over time. 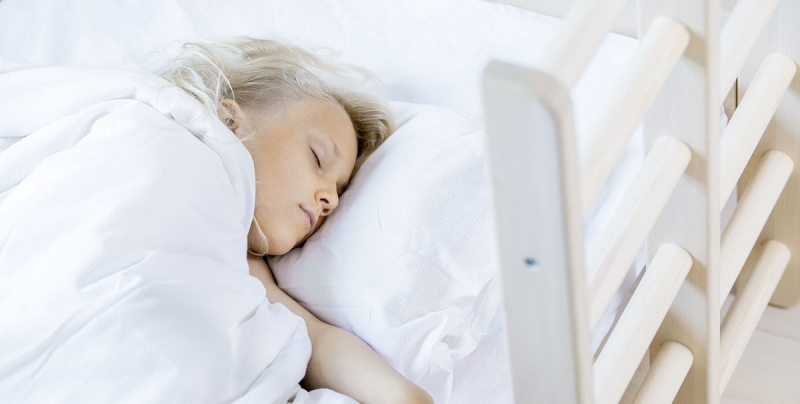 The Gymi Bed grows with your child and can be built into a bunk bed when your family gets bigger. 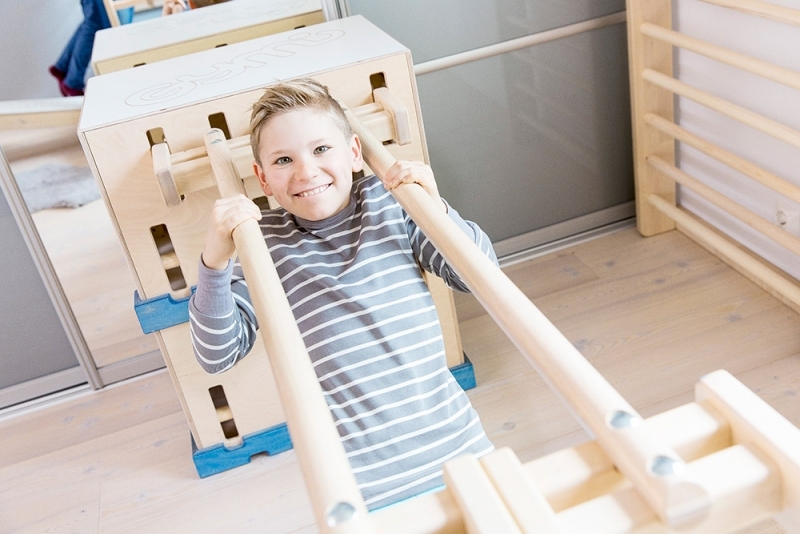 The boxes, planks, ladder and wooden poles can be used to build a track for parkour or tricking, gymnastics as well as for fun games and play. 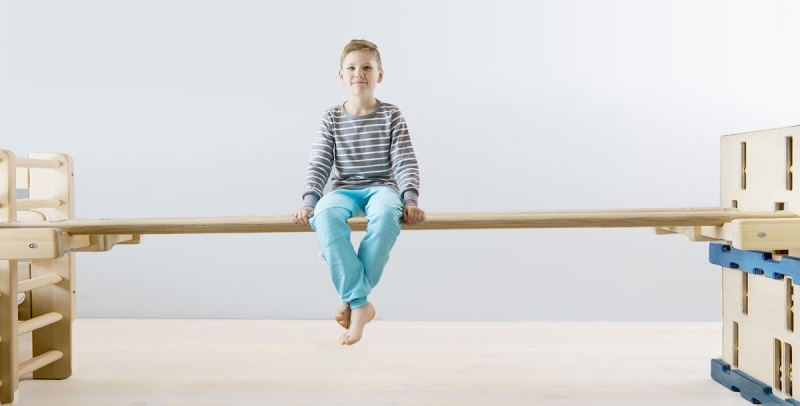 The Gymi Furniture wooden pole can be used to build parallel bars or a rail, and the plank serves as a balance beam, bench, slide, desk, table or a parkour rail. This all in your own home or in the classroom! 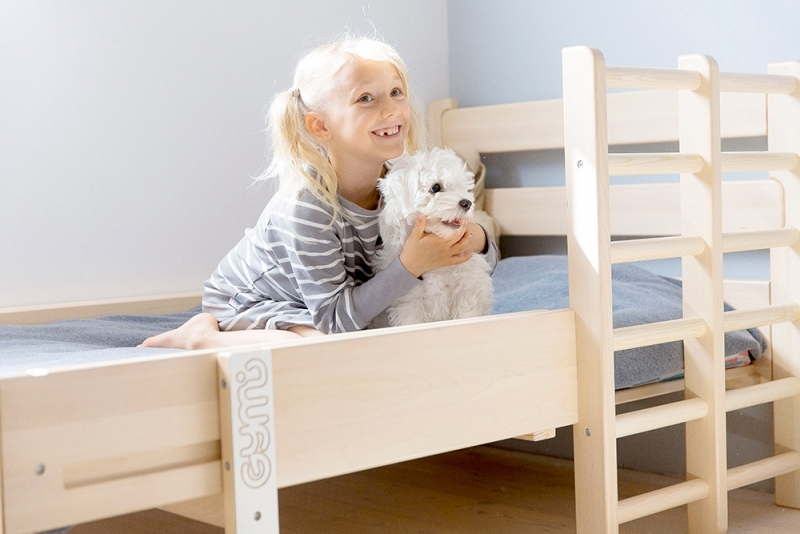 The Gymi Furniture replaces the traditional kids’ furniture. 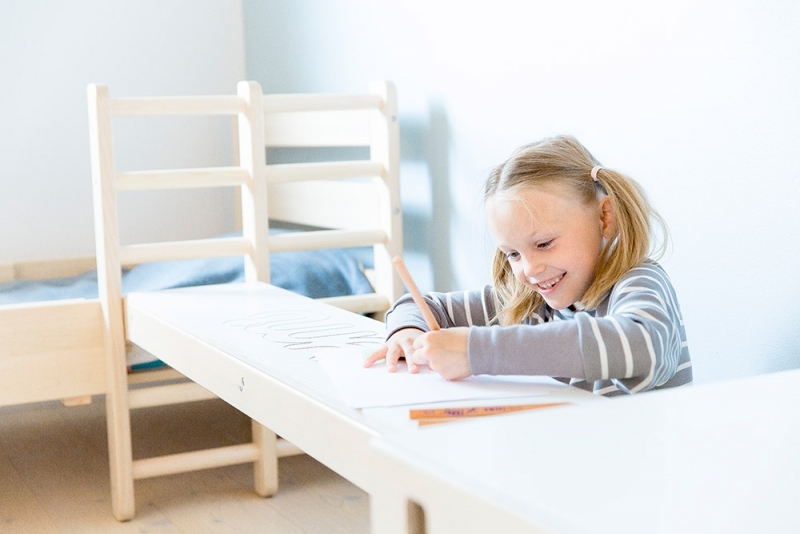 When the plank is attached to the bed and a box, a desk is formed where the child sitting on a gym ball or standing on a balance board can for example do homework. The boxes can be put on top of each other which makes it possible to alter the height of the plank or wooden poles attached to the boxes. Wooden poles serve as clothes rack, rail or horizontal bar for gymnastics. You can find more detailed information about the products in our Gymi Shop online store. Welcome shopping! Because of the high quality and versatility of the furniture, Gymi Furniture is perfect for public places. We have designed products of bigger size to suit schools, kindergardens and other public spaces. Our products can be used to furnish classrooms as well as corridors. Because Gymi Furniture pieces are also gym equipment, they naturally fit also in private gyms.